In 10-inch skillet, heat oil over medium heat. In medium bowl, beat eggs and milk with whisk. In large bowl, stir together Bisquick mix, cornstarch, paprika, chili powder, ground red pepper and salt. Dip cauliflower florets into egg, then into Bisquick mixture; dip again into egg and coat with Bisquick mixture. Place in hot oil; fry until golden brown. 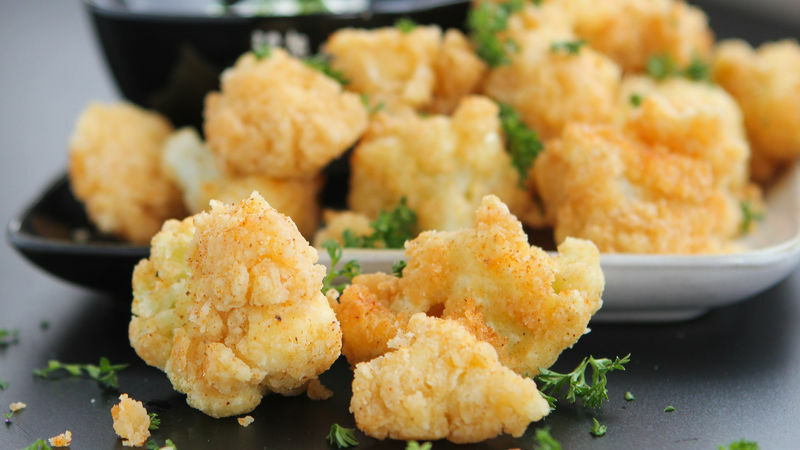 Transfer fried cauliflower to clean plate lined with napkins or paper towels. In small bowl, beat sour cream, cheese powder and dressing mix with whisk until well blended. Serve cauliflower immediately with sour cream dip. Enjoy! To ensure even cooking of the cauliflower, fry in oil heated no higher than medium on your stovetop. Like it spicier? Double or triple the amount of ground red pepper (cayenne) in your recipe. Don't want it spicy? Feel free to leave the cayenne out!